The holidays are coming soon and YHS Crew is selling beautiful holiday wreaths to help you deck your halls. Beginning today, we are offering 24” Balsam wreaths decorated with white-tipped pinecones, red berries and a red velvet bow for $25 (local) or $35 (mail order). All wreaths arrive individually bagged to provide for a fresher product, longer storage, and needle containment. These wreaths make excellent gifts for family and friends, as well as business associates, clients and customers. Funds raised from this effort help to maintain and upgrade our rowing fleet in addition to supporting our rowers and coaches with necessary supplies throughout the season. To order a wreath, please contact your favorite Yorktown rower, or wreath coordinator Jenn Vogel. The 2017 wreath sales flyer is located here and order form here. All orders and payments must be received by November 4th. In early December, rowers will deliver wreaths to all local customers. 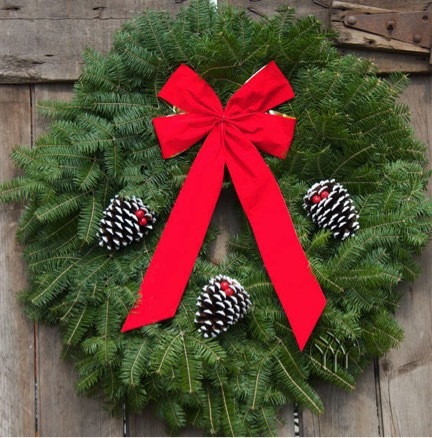 Mail order wreaths can be shipped anywhere in the continental 48 states directly from our Minnesota supplier and can include a personal greeting from you. Please note that a complete street address is required for mail orders. Thank you for supporting Yorktown Crew! No Replies to "Yorktown Crew Selling Holiday Wreaths"